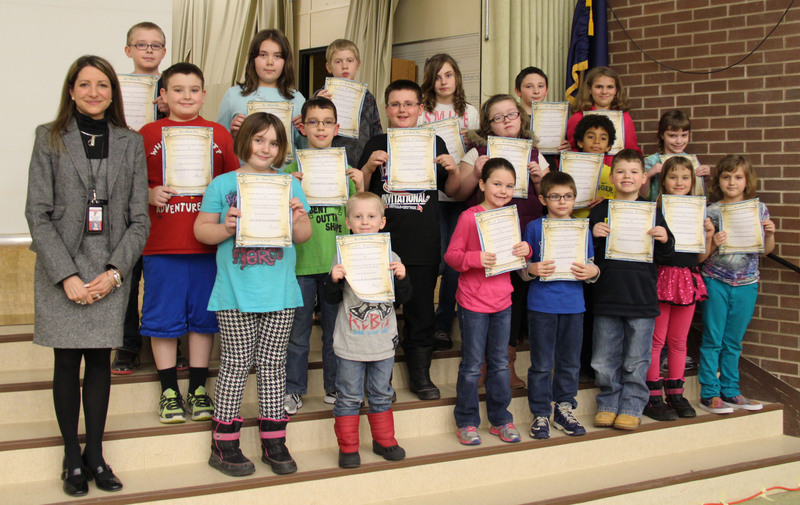 Volney Elementary School students attended a spirit assembly March 28 in recognition of their positive behavior and for being role models. Principal Lisa Garofalo congratulates Volney students who were named “On a Roll” models for March. Principal Lisa Garofalo gave certificates to one student from each classroom that exemplified the character trait of perseverance. 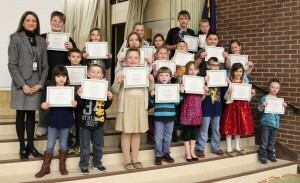 In addition to the classroom role models, 22 students were awarded certificates for being “On A Roll” models. The monthly classroom role models were Ava Greeney, Chase Spohn, Calie Shepard, Aidan Brewster, Alyssa Sowyer, Sabastain Nastasi, Rylee Bartlett, Destiny Newton, Daymon Hooper, Madison Baum, Hanna Miller, Skylar Cary, Deven Searor, Lyndsey Warner, Alexander Knapp, Mackenzie Palmer, Abigail Pawlewicz, Abigail Lunderman, Nicholas Smith, Camrin Galvin, Emily Morales and Jacob Shatrau. First grade student Wyatt Pastorell, the school’s “It’s Cool 2B In School” monthly award winner. “On a Roll” models included Autumn Warring, Brett Reakes, Ava Ditton, Alekzander Roberts, Nicholas Rusaw, Layne Osborn, Jaina Vernon, Mitchell Donaldson, Brody Snyder, Lucas Nelson, Kayla Leach, Gibran Catano-Maty, Alaina Reynolds, Richard Mintonye, Abigail Sheffield, Rain Frank, Mackenzie Birdsell, Tyler Emeterio, Heidie Hall, Payton Sharlow and Ares Garrett. First grade student Wyatt Pastorell of Kathleen DeLisle’s class was chosen as the “It’s Cool 2B In School” award winner. 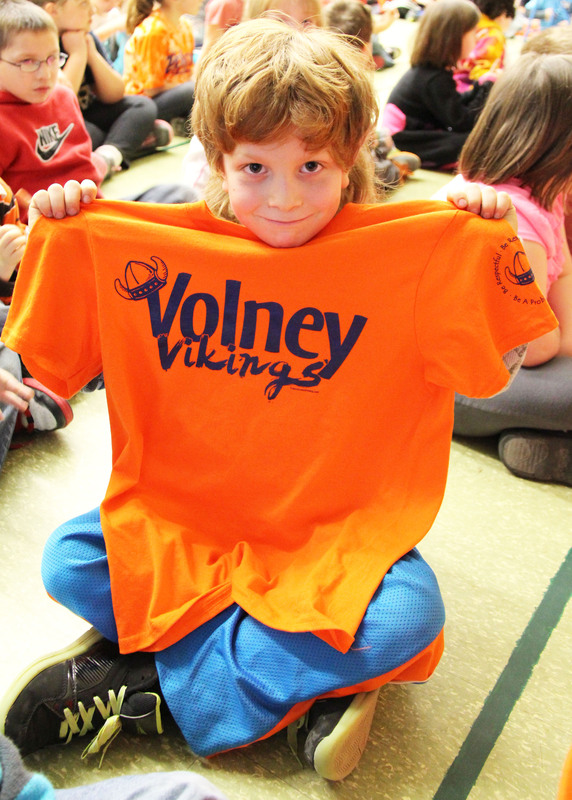 He received a Volney Vikings T-shirt for his exemplary attendance. After the awards presentation, students watched an anti-bullying video clip. 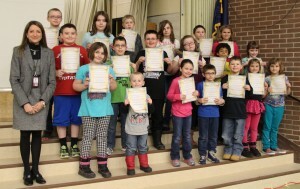 Volney Elementary School Principal Lisa Garofalo recognizes students for being classroom role models and exhibiting the trait of honesty during the month of March.